Even while he was still alive, Dominican friar Albert of Cologne was widely called Magnus the Great. His contemporaries said St Albert simply knew all there was to know; he was a scientist, theologian, and philosopher; a teacher, preacher, and negotiator; a shrewd shepherd and an unflinching defender of the Faith. The time has come to re-discover St. Albert s greatness, and to profit from his prodigious wisdom and virtue as did his famous student, St. Thomas Aquinas. Author Kevin Vost presents St. Albert s brilliant scholarly career at the height of the Church s intellectual renewal in the thirteenth century. St. Albert was tireless (and courageous) in his leadership and works of reform as a Dominican provincial and diocesan bishop. Desperate popes pressed him into diplomatic missions, hoping that Magnus might succeed in making peace where lesser men had failed. These pages not only tell St. Albert s story they share his lessons. Each chapter uses Albertine teachings, and the witness of the saint s life, to instruct, edify, and inspire us to greater holiness and more ardent love. 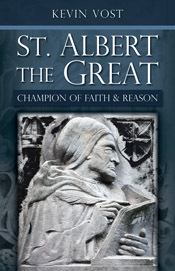 Read St. Albert and see why the greatest man of his age has great things to offer our age as well.